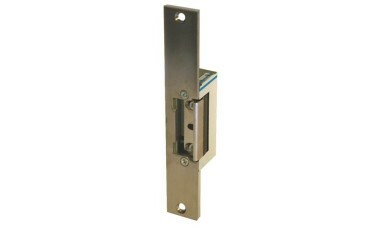 Asec M12/M24 Low to medium duty Electric Release, with Stainless steel faceplate and Adjustable jaw. The 12V DC / 24V DC are continuously rated. Hi, guys. My name is Darrel and I'm head of the tech team here at LocksOnline.co.uk. Today we're talking product reviews and, more importantly, we're talking about some strike releases. The strike release that I have in front of me that I'm going to have a chat with you about now is the M12 or M24 strike release manufactured by the company Asec. Now in my view, this is probably for a medium duty, light to medium duty, sort of application. If your budget allows, consider this particular type of strike release. We're down on this Welsh coast and for our sins, as much as it's nice and beautiful down here, we do get a lot of salt weather coming in and therefore then having something that is a little bit more durable in regards to its finish and so forth is a little bit more paramount for us. What Asec have done on this particular application have decided to put a stainless steel faceplate on this particular type of strike release. Now the reason why you would be considering using strike release or electric strike release, depending on the terminology you need or use, is to work with dual intercom systems or access control systems where you want to remotely release that door from, say, a flat or a reception or something like that and you've got a lock that is in the door. This is a mortice version that sits in the frame and it's in the door. If you want it to actually release the lock remotely, you can press a button, this would fire up and of course then the door would be pushed open. Probably 99.9% of us all have gone through a door some time or another that has some form of strike release or electrical release on it. The benefit of this, as I have already mentioned before, is that the faceplate is made of stainless steel and so therefore then it gives it that little bit of more panache and of course a little bit more durability. Hopefully with a little bit of tanning of a little bit of oil every so often then it is going to look as good as the day that you fitted it. One of the distinct advantages of this particular type of strike as well is that is has an adjustable jaw. Now inside there you can see we've got two screw fixings and this jaw can be manoeuvred in and out. Now, you might think, "Well, what's the purpose of that?" Let me show you. When I used to be on the tools and you were fitting one of these for the first time or you have fitted a few of them, you're only going to be out by a fraction on your measurements and you're going to find that the latch is a little bit too stiff or it doesn't sit properly or it's rattling all over the place. At least then you have the ability to adjust that jaw in and out to give you, the installer, that degree of flexibility. Also, as the summer, winter, the seasons go around, doors swell, doors expand, doors contract. You do have the ability to adjust that jaw so therefore then as it starts to get loose or it starts to get tight you can manoeuver it so you can always have a degree of flexibility. That's the reasons why I do really like this particular type of strike release. Now it comes in a failed locked and a failed unlocked version now the difference between those two is that a failed lock if there is no power to the actual strike or to the access control system, let's say that for an example the power was to fail on the property, then your security would not be compromised. In other words it would stay locked, failed locked. If it's failed unlocked and you would normally use those types of systems on emergency exits or in between doors between different areas where in the event of a fire or in the event of an emergency or in the event of power failure the actual door needs to become free access. This particular one that I have here in front of me is actually a failed unlock version. As you can there, the door is working without any power applied to it. Now when power is applied this then, it will actually stay in its upright position so it will stay in the locked position. They also do a 12 AC version of this strike, but only in a failed lock application. Now a little bit of a top tip when you're thinking about replacing your strike release, one of the things that you can be aware of: do you have AC or do you have DC? On this particular one here you can see, if you zoom in there, you can see that it actually says 12 volts there and it's got a little bar by the DC which means that it is a 12 volts DC version. Some people have got sticky labels on them, and over time they wear off. So a little top tip is that if the strike release used to buzz then the chances are it's AC. And if it clicks then the chance are it's DC. So that's a little but of a top tip there for you. The connections for this are on the front, as you can see there, or on the bottom, depending on which way you hold it up, the top or the bottom. And also this faceplate here is white at the moment. If I were to peel it back then again it would be stainless steel inside there as well. That's just on there to maintain the finish whilst you're installing it. What I'll do now is get you some quick measurements. The overall faceplate length there is 160mm. Its width there is 25mm. The jaw depth there is 7mm. Okay. It moves from the end position there, just to give you some idea the amount of flexibility we have, that there is 7mm and if I was to move that out to the furthest position there, I've now got something in the region of about 16mm. So there's a lot of movement there between those two measurements there if you need to adjust it. The actual depth, how much you would have to mortice out of the door, is 30mm there on the frame. And the width then is 20mm, as you can see there. So there you go, guys. Me personally, I have actually fitted quite a few of these when I used to be on the tools so I can vouch for them. They're all all right for light to medium duty. Don't put them in a heavy industrial area or where the door is being used constantly for 10 hours a day. You'll find that they will probably prematurely fail in that application. But if you've got a door to a block of flats, say four flats or something like that, where there's average daily traffic, then I don't see there being any problem to using this particular type of strike release. But if you need a bit more information or you want a bit more advice, by all means pop onto our live chat on our website. You can chat with me or any of the guys. We're all pretty knowledgeable on all these particular range of products. More importantly, we'd love to see you as a customer so come and say hi. From me, Darrel, and all of us here at the LocksOnline team, take care and we'll catch up with you soon. Bye-bye.